Kim Herbst - Illustration: Buried v2.0 - & Worn? Oh yeah. Thinner lines!! I think I'm happier about that. More simplistic colors/shadows too. ...Granted I drew a whole bunch of origami cranes again. I really can't get away from them! They're too much fun to draw. I suppose this can go with this week's Illustration Friday! topic of 'Worn' as well. 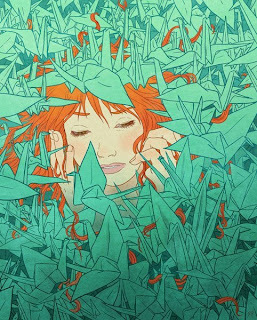 My hands would certainly be worn from folding all those paper cranes. breathtaking color + wonderful contrast. The layout and detailwork in your piece is fantastic..and of course her expression. Such a great entry for this week. this must have taken forever in a day,kudos for that. So meticulous! I also suffer from the crane obsession. Beautiful Work Keep it up!